I have been reviewing subscription boxes for over 6 years now (I’ve reviewed thousands of them), and the top questions I always get are, “What subscription box would you recommend?” or “What’s your favorite subscription box?” Since there are so many monthly subscription box options, I usually answer the question with a question. Are you interested in beauty boxes? Meal kits? Clothing subscription boxes? etc, and try to narrow things down to a few top recommendations. What I’ve realized over the years, is that I keep coming back to a small number of boxes that I recommend because they have stood the test of time. These are boxes that are the best of the best, they have been around for years, and they just keep getting better! So, if you’re new to subscription boxes and don’t know where to start, this list is for you. Any option below is a good one, and this list covers all price ranges and interests! Why’s it’s the best of all time: Ipsy has been around since 2012, and they have consistently delivered an amazing value in beauty products that entire time. They send you 5 beauty products + a new makeup bag every month. And they’ve been improving things since launch, too. The subscription box is customized to your beauty profile, and you can rate all the items you receive, so your products will become more customized over time. You can expect to receive a mix of full-size and deluxe-size products, over a range of brands. (Think high-end brands like tarte, MAC, Make Up For Ever, and a few lower-price point brands, too. The exact contents you receive will be determined by your profile, but the average value of a bag is usually over $40! Read our Ipsy reviews to see what they’ve sent in the past to see if this is a good fit for you! FYI, Ipsy is in waitlist mode, but you can use this link to bypass the waitlist! Why’s it’s the best of all time: This is my go-to recommendation for anyone looking for a great subscription box for men. (And most of their boxes are actually gender-neutral, so this is a great subscription for women to consider, too.) Bespoke Post is another monthly subscription that has been around since 2012, and they are still putting together unique + awesome boxes every month – it’s impressive. Each month they release a few new curated box collections, and subscribers get to pick which box they want. The boxes vary a lot, but the one consistent theme is quality. Think of it as a way to upgrade one piece of your life every month. (For example, one month you might pick out an amazing bar set, the next month a classic jacket you’ll wear for years, etc.) And the value is consistently higher than the cost of the box, too! Read our Bespoke Post reviews to see what they’ve sent in the past to see if this is a good fit for you! Click here to sign up for Bespoke Post! Read our Barkbox reviews to see what they’ve sent in the past to see if this is a good fit for you! Click here for the latest Barkbox coupon! 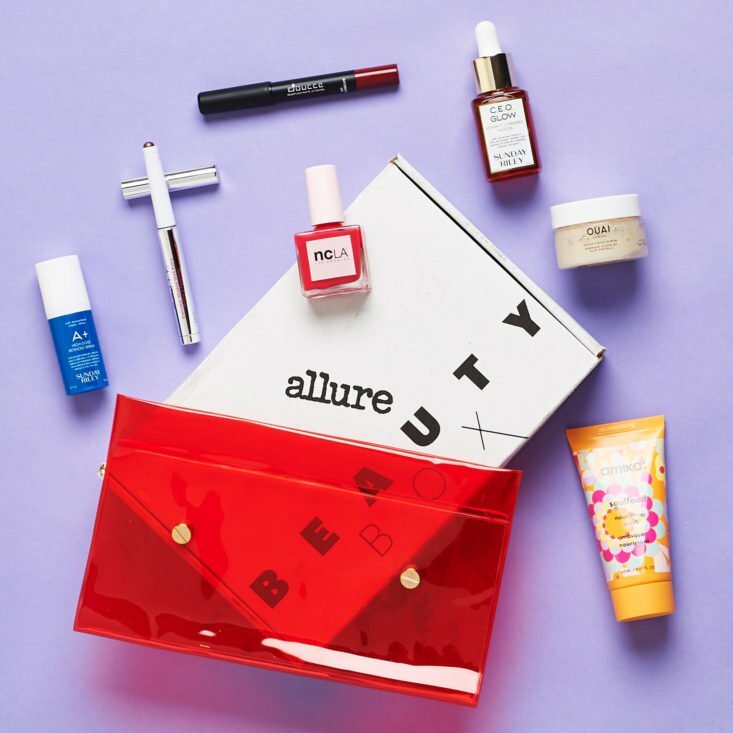 Why’s it’s the best of all time: This subscription box from Allure magazine editors is the perfect way to keep up to date on current beauty trends and try out some luxe brands. They’ve been around for years, and they are still keeping it exciting by sending subscribers newly launched products, beauty award winners, and the occasional indie-beauty-brand find, too. Readers voted Allure as one of our top boxes for women! You can expect to receive 5-6 items each month, full-size and deluxe-size items, and an average value of $45+! Read our Allure Beauty Box reviews to see what they’ve sent in the past to see if this is a good fit for you! Why’s it’s the best of all time: Menlo Club has been around for years (they used to be known as Five Four Club), and they have always provided great quality clothing at a really fair price. My husband Eric has tees from Five Four Club that are 4+ years old and still look like new! You can expect to get 2-3 clothing pieces every month based on your style profile and measurements. And if anything isn’t a good fit, you can exchange it for a different size at no cost. Read our Menlo Club reviews to see what they’ve sent in the past to see if this is a good fit for you! Click Here to get the latest Menlo Club coupon! Why’s it’s the best of all time: Sephora has successfully taken the fun experience of browsing a Sephora store, and turned it into an inexpensive subscription box! You get to sample amazing brands, new products, get tips for how to use them, and you can even bring your subscription box to your local Sephora store and get custom tutorial! Expect to receive the exact brands that are carried in Sephora stores. You’ll typically get a mix of skincare, haircare, fragrance, and makeup. 6 samples every month, plus a reusable bag! Read our Play! by Sephora reviews to see what they’ve sent in the past to see if this is a good fit for you! Click here to sign up for Play! by Sephora! Why’s it’s the best of all time: I’ve reviewed so many book subscription boxes over the years, and I think Book of the Month is the best box for any type of reader. It’s customizable, so you get to pick exactly which book you want out of 5 new releases, and they cover a variety of genres, so there will always be something that’s a good fit for you, and something to push you out of your comfort zone! Read our Book of the Month reviews to see what they’ve sent in the past to see if this is a good fit for you! Click here to get the latest Book of the Month coupon! Why’s it’s the best of all time: BeautyFix is a subscription box from the mega beauty site, Dermstore. They’ve been around for years, and they consistently deliver a great mix of full-size, deluxe-size, and sample-size products with a skincare focus. This is a great way to try pricey serums, moisturizers, face oils, etc., and know if they are a good fit for you before ever paying retail price! On average, the total value of the box is over $100! Expect 7-9 beauty products each month with a focus on skincare. You’ll also receive haircare items, and the additional beauty tool and makeup item. Read our BeautyFix reviews to see what they’ve sent in the past to see if this is a good fit for you! Click here to sign up for BeautyFix! Why’s it’s the best of all time: I polled everyone in the MSA office, and this is hands down the favorite snack subscription box. (We’ve been reviewing it for years.) Graze is pretty amazing because they send you nutritious, healthy snacks that are so delicious and addicting! You’ll get 8 individual snacks in each box – the perfect size for a snack break. I love Graze because they customize your snacks to your dietary + snack preferences. Want to avoid dairy, gluten, etc.? They’ll follow your guidelines. You can also rate the snacks you receive to help them better customize your snacks over time. Read our Graze reviews to see what they’ve sent in the past to see if this is a good fit for you! Click here to get the latest Graze coupon! Why’s it’s the best of all time: This is the original clothing subscription box, and it’s still one of the best. Over the years they’ve grown from catering to just women in a certain size range, to covering all sizes (plus size, maternity, petite), and there is now an option for men and kids! Expect to fill out a profile giving your stylist all the info they need to send you 5 items they think you will love. You can even tell your stylist what price range you want to make sure you stay in budget. (And if you keep all 5 items, you’ll receive a 25% total discount.) If your first shipment isn’t a perfect fit, don’t worry. It usually takes a few tries with your feedback to get into a groove! Tip: Make sure to create a Pinterest board of your favorite looks and share it with your stylist via your Stitch Fix profile. Showing my stylist exactly the types of clothing/outfits I liked resulted in such an improvement in what she picked for me! Read our Stitch Fix reviews to see what they’ve sent in the past to see if this is a good fit for you! Why’s it’s the best of all time: Kiwi Crate has been around for 5+ years, and over time they’ve added to their subscription offerings to now cover all ages from newborn to 16 years! If you are looking for the perfect subscription box for your kid, this is the subscription I would recommend to check out first! You can expect to receive projects + activities based on your child’s age. There are multiple projects per box, so the fun lasts for a while, and lots of the included items are STEM-focused. It’s a great way to encourage creative play with your child! Read our Kiwi Crate reviews to see what they’ve sent in the past to see if this is a good fit for you! Click here to get the latest Kiwi Crate coupon! Why’s it’s the best of all time: This is the original wine subscription box (it used to be known as Club W), and it’s done a great job at elevating wine subscriptions from the previous “Wine of the Month Club” model. They source unique, small production wines directly from vineyards and winemakers, and keep the prices quite reasonable, too. Read our Winc reviews to see what they’ve sent in the past to see if this is a good fit for you! Click here to get the latest Winc coupon! Expect to get a handle + 4 blades every month, and add on anything else you need for the shower + bathroom easily! Read our Dollar Shave Club reviews to see what they’ve sent in the past to see if this is a good fit for you! Click here to get the latest Dollar Shave Club coupon! Home Chef – meals start at $9.95 per serving, and delivery is free for orders over $45. Why’s it’s the best of all time: We’ve sampled every food subscription box that exists at My Subscription Addiction, and Home Chef is the one box that every reviewer can agree on! The ingredients are consistently fresh, and the meals are delicious – you’ll want to save the recipe cards! In addition to the quality of food, this is my top pick because it can work for just about any diet. Low calorie, low carb, gluten-free, soy-free, vegetarian – they cater to everyone with 18 different meal options each week! Read our Home Chef reviews to see what they’ve sent in the past to see if this is a good fit for you! Click here to get the latest Home Chef coupon! Trunk Club – $25 styling fee per box, credited to whatever you decide to keep. Expect a truly catered stylist treatment, and you can give feedback on items before they ship. There are no surprises with this clothing stylist service! Read our Trunk Club reviews to see what they’ve sent in the past to see if this is a good fit for you! Click here to sign up for Trunk Club! Looking for more subscription boxes? Check out our list of subscription boxes that you can try for $10 or less!